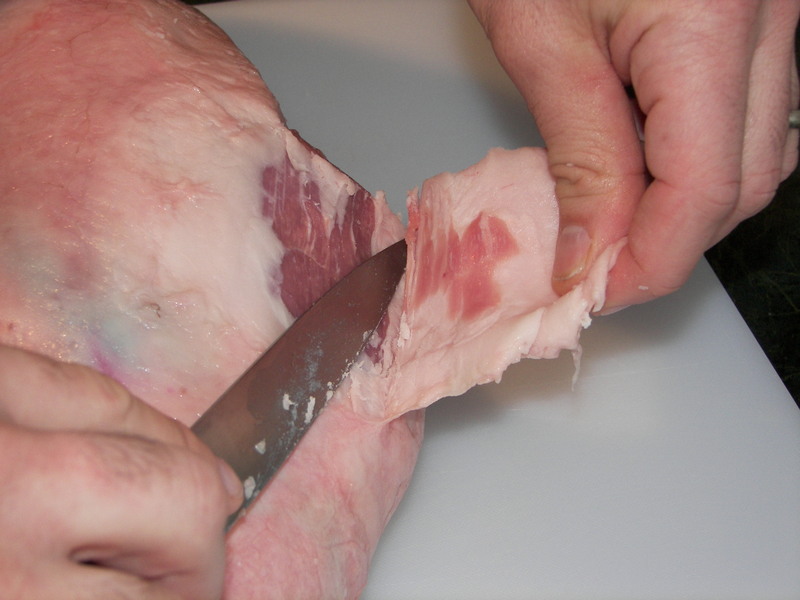 Begin by trimming off some of the fat that covers the outside of leg. This task is significantly easier to accomplish before the leg is de-boned. Discard any unwanted fat. 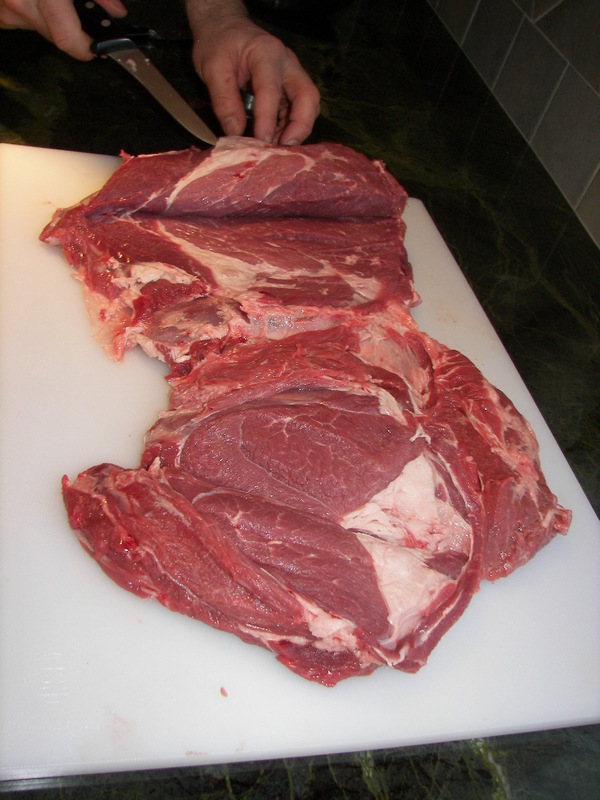 Note: Some people prefer like to leave a thick layer of fat on the meat. I personally find lamb fat to be unappealing and tend to remove as much of it as the cooking method will allow. Turn the leg so the ball joint of the upper leg bone faces up. This will also position the inseam of the leg facing up. Position the blade of a sharp knife directly on top of the bone and make an incision that runs from the ball to knuckle (knee joint). The top of the upper leg bone should be visible once the incision is spread apart. The next incisions will run along the right and left side of the leg bone. The tip of the knife should not penetrate deeper than the bottom of the bone. These side incisions should also run from the ball joint to knuckle. Spread the meat apart so the entire bone is exposed. Insert the knife underneath the bone by the knuckle and run the blade toward the ball joint. The side of the knife should run along the bottom of the bone. 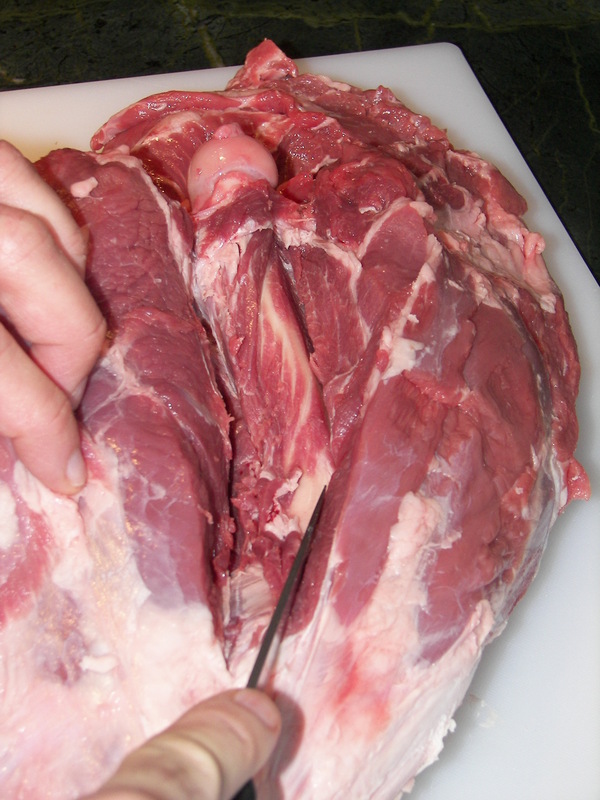 Cut carefully around the cartilage and sinew surrounding the ball joint. This should free the entire top portion of meat. Repeat the process for the lower portion of the leg (Hind Shank). 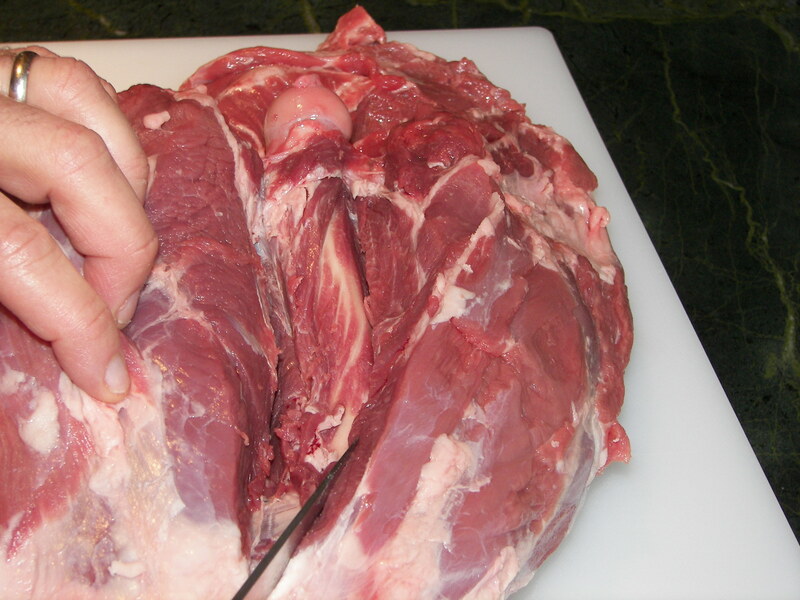 There isn’t that much meat on the inseam of the hind shank, so begin by making an incision on each side of the shank bone running from knuckle to the bottom (Hoof end). Slip the knife blade under the bone just below the knuckle. Run the blade along the bottom of the shank bone toward the hoof end. This should free the bottom portion of the meat. Carefully cut around the cartilage surrounding the knuckle. The meat from the entire leg should now be free from the bone. Note: The lower shank portion of meat can be dry and chewy. Some people prefer to slice this portion off and save for use in another recipe. Once the leg is de boned, it is very important to remove the gland that is located between the top and bottom round. 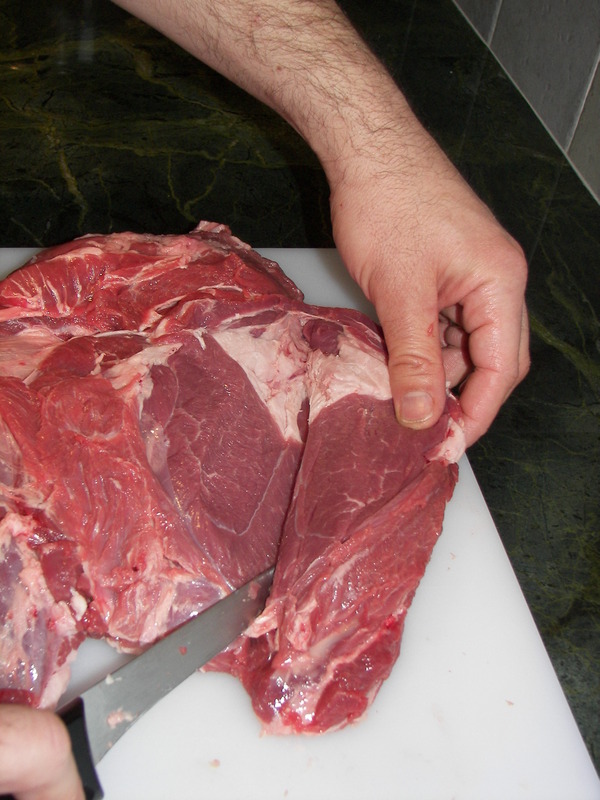 To do so, spread the meat flat with the cut side facing up. Locate the gland (It is usually surrounded by a large chunk of fat). Cut the gland and as much surrounding fat away as possible. 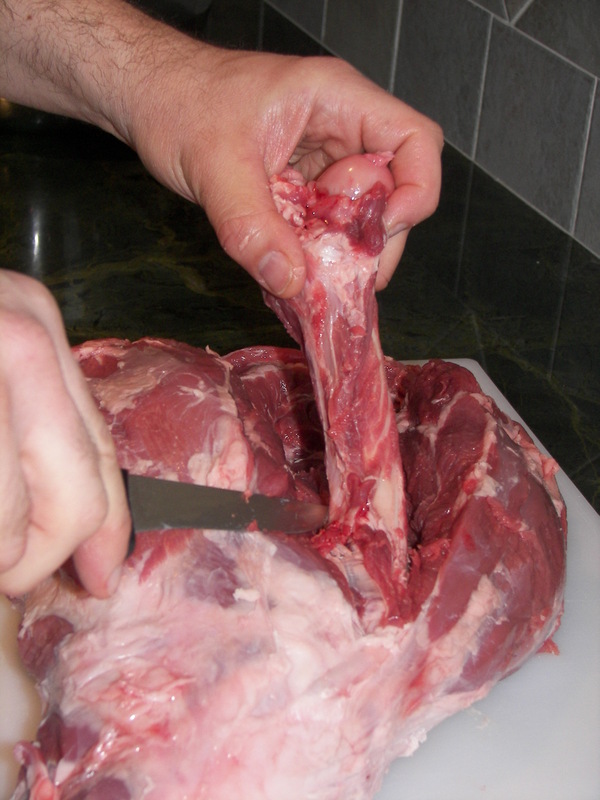 Butterflying the lamb entails slicing partially through the thicker portions of meat and unfolding them so the entire boneless leg of lamb becomes a uniform thickness and practically doubles in size. 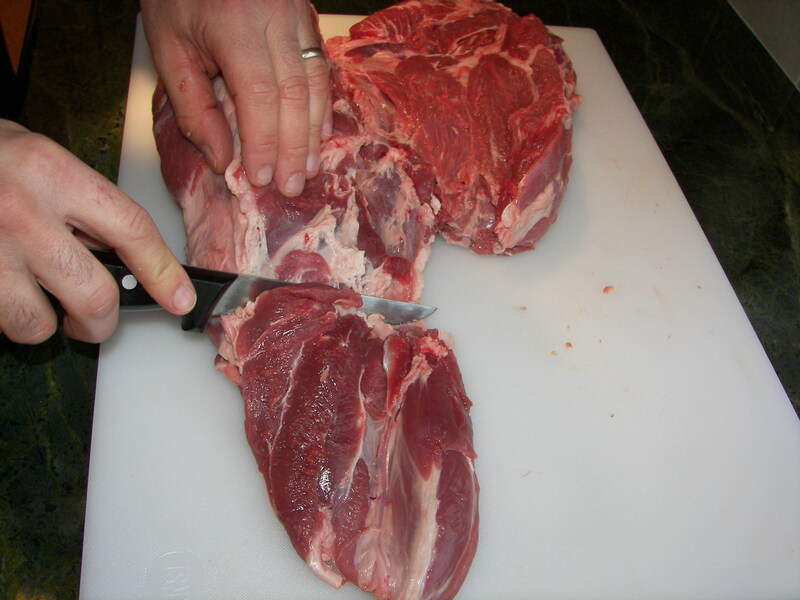 Begin by laying the boneless leg of lamb on a flat cutting surface with the inseam (or cut side from de-boning) facing up. Two sets incision will be made. One will be toward the left and the other toward the right. 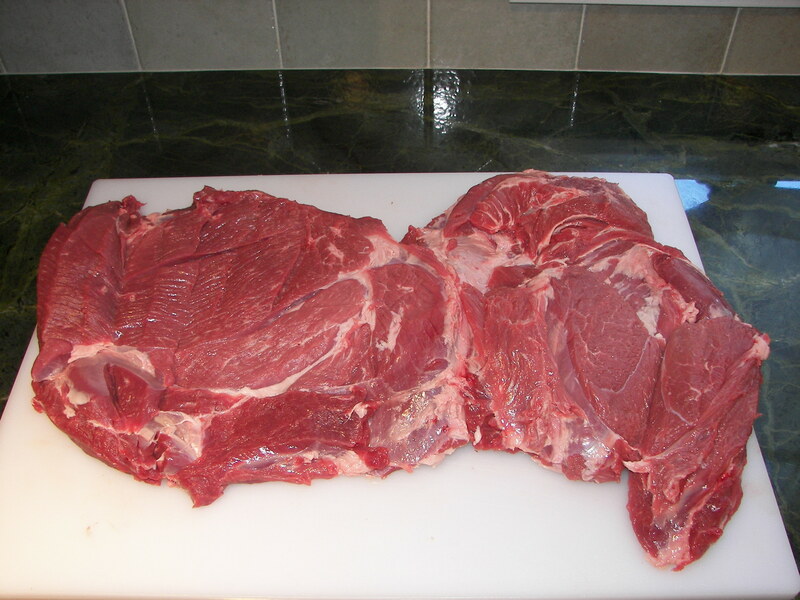 As a result, the flaps of meat will unfold to the left and right. 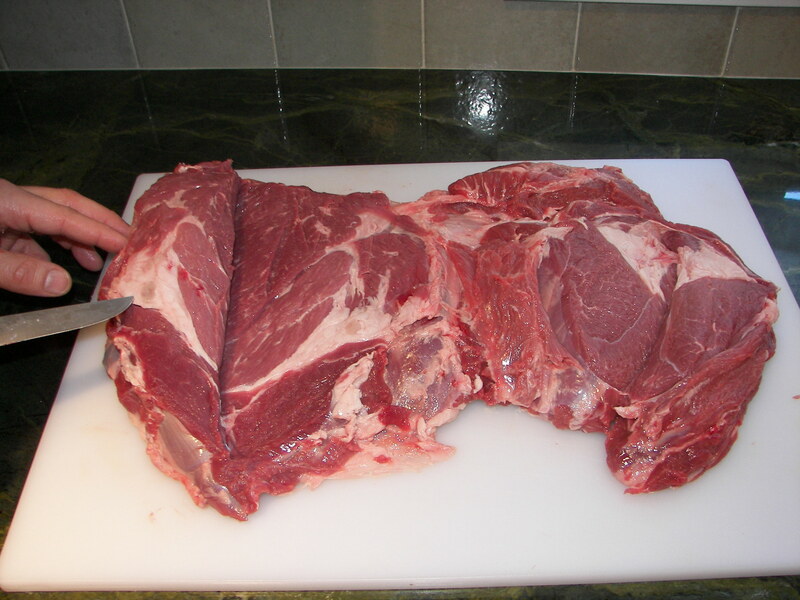 Both left and right cuts should begin in the channel of meat where the bone was removed. This is essentially the middle of the lamb leg. 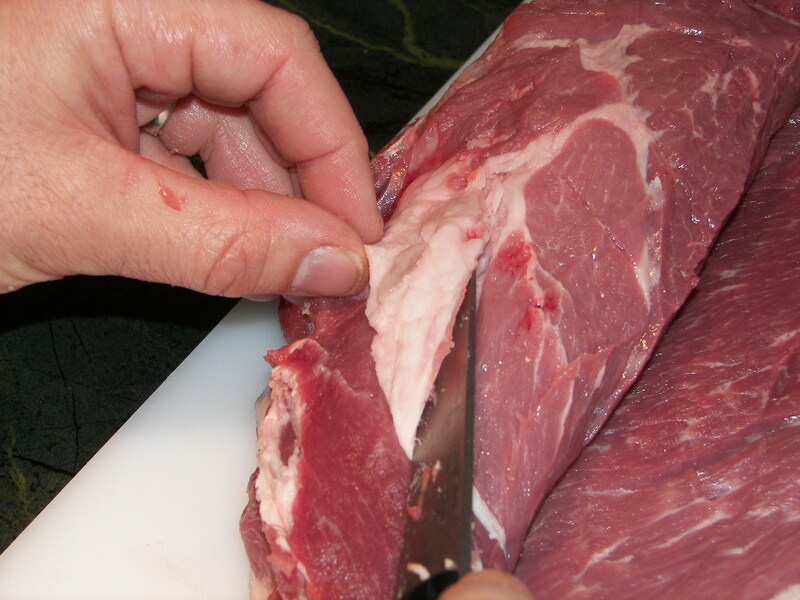 The point of the knife should pierce the left side of the bone channel and travel the entire length of the meat, from top to bottom. The flat edge of the blade should run parallel to the work surface. Unfold the top flap of meat as you go. Be careful not to slice all the way through or else you will be left with two smaller pieces instead of a large one. Continue slicing and unfolding until the entire left side of the leg is laid out flat and relatively the same thickness. Repeat the process on the right side. 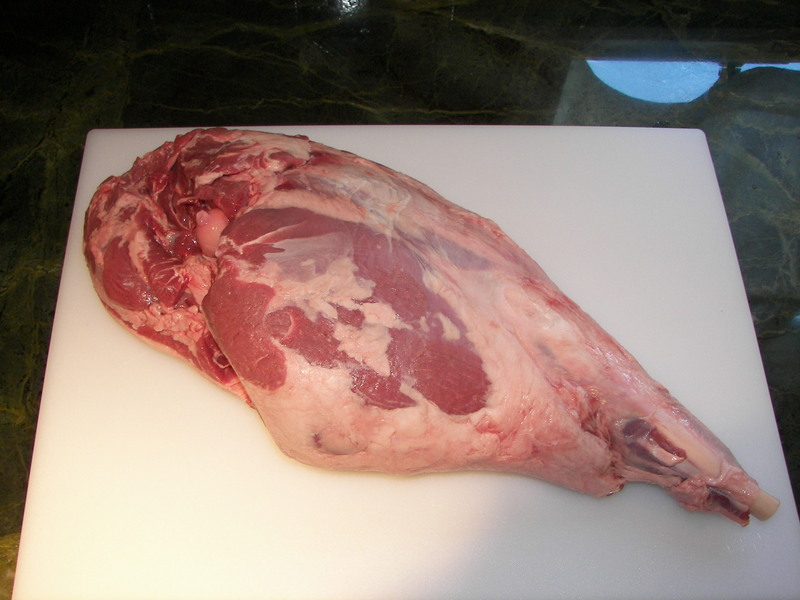 Once complete, the leg of lamb will be ready for the desired cooking method. Great presentation! I roast a leg of lamb about once or twice a year. But I never know about this gland (never deboned or butterflyed). Why is it so important to locate and remove. Thanks Pat for visiting out blog. 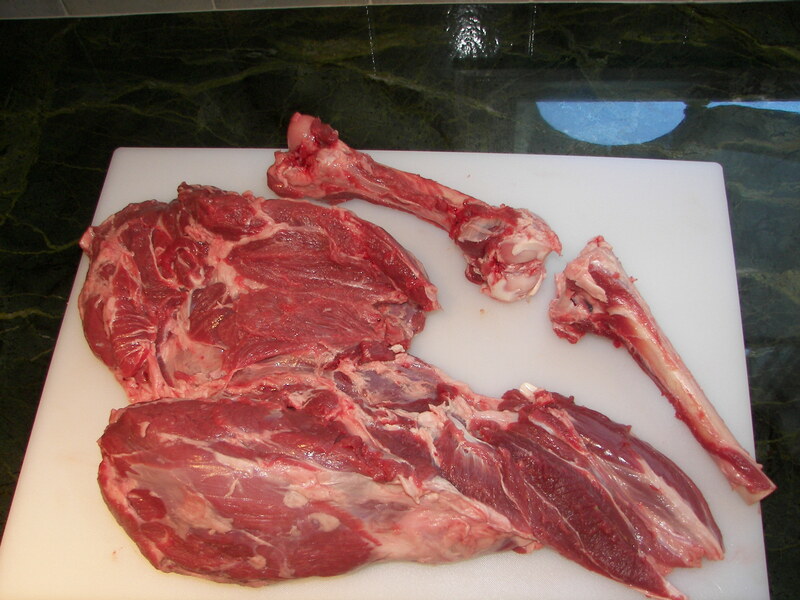 Cut that gland out the next time you cook a leg of lamb. It qwill be laess gamey tasing. I recently attended a cooking class and it was here I learned about this gland and how to remove it and debone the leg of lamb. I was told that leaving this in makes it very pungent when cooking and a lot of people are put off of eating lamb due to this smell when cooking. Removing the gland made all the difference to the smell of the lamb when cooking and the lamb tasted wonderful without it it. We agree with you about removing the gland. It does make all the difference. I grew up in a hunting and fishing family. We would also remove the gland from haunches of venison. It significantly reduced the gamey flavor. Thank you for visiting our blog. We appreciate it.